50 to 70 bucks a week affordable CHILDCARE in College park, Ga... Safe Haven for kids. Want to connect with Jamika? 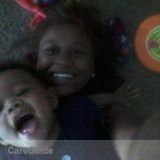 Hello everybody I am Jamika Whitfield and I have a 15mth old son. We live in college park, ga. I've been babysitting for about 3 years, I loved it so much I decided to have a child of my own. 70$ A WEEK if child is older than 3. BUT I AM WILLING TO WORK WITH YOU AS LONG AS YOU ARE WILLING TO WORK WITH ME. If your child uses diapers, wipes or formula YOU WILL HAVE TO PROVIDE. I provide meals and snacks. If you only want M-F no matter what age your rate will be 50$ a week. Now seriously moms, you can't beat 50$. But your child must be picked up by 9:00PM no more than 30 minutes late.. Because I know how it is.. I love kids, I give nothing but love, I keep my bible open EVERYDAY, yes we love Jesus over here. BRING YOUR CHILD HERE WHERE ITS SAFE, FUN AND WHERE I LET KIDS BE KIDS. I PROTECT YOUR CHILD LIKE I PROTECT MY OWN. Give me a call your child can START TODAY.